First let me say thank you for praying. And thank you for contacting us and showing your love and concern for us. I have spent a lot of time in the last day keeping up on correspondence but it has been a good and necessary task. It has reminded me of how many people lift our family before the throne of grace. 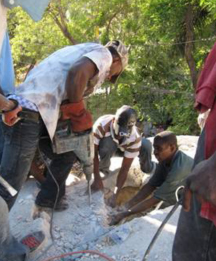 The earthquake in Haiti just before 5 PM did damage places south of us but here at Kaliko we only experienced strong tremors. No damage to buildings or property. Heather was at home on our deck. She said at first she thought a truck had an accident on the highway and was rolling down the hill towards the house. The tremors lasted about 20 seconds here. The kids and I were down in the pool at Kaliko. I stood up and had a hard time staying in one place. The kids did not freak out but the pool was like a wave pool, with water spilling out the sides. We are grateful to be OK. We are still experiencing some light aftershocks. 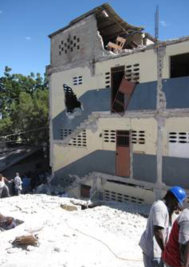 Today I spent the day in Port-au-Prince helping dig people out of a collapsed school building. 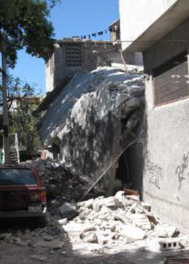 God was very gracious and with a generator and power tools we were able to free 10 young girls from the rubble. They all had non-life threatening injuries and were taken to a local hospital. Sadly we did also remove about 12-14 bodies from the wrecked school. It seems there is always joy alongside weeping here in Haiti. Below are some pictures of work at the school today. We are very grateful that most of our missionary friends and folks from the churches escaped without injury. Lagonav experienced the same tremors we did here with some walls coming down and damage to buildings. No injuries are reported but the cell network is swamped and communication within the country is very challenging. Pastor Octavius Delfils of the Port-au-Prince church plant was seriously injured along with his son Carlins, apparently when their house collapsed. We do not know his condition but please pray for this dear man of God. Continue to pray for all the rescue efforts. People are working very hard with very little in the way of resources. Pray they would not grow weary in well-doing. Give thanks our family was not injured. Pray God would give our kids peace and they would sleep well. They are doing fine. Ask God for wisdom as we consider how we can best serve the church and greater Haitian community over the coming days. We want to make the best use of our time and resources. Pray that people through this very difficult providence would see their need for a Savior. Haiti continues to be a very dark land spiritually. I try to keep the blog updated regularly. If you want an invitation just zip me a quick e-mail. There is also lots of news on the web. The Miami Herald is a good place for Haiti news as they do have reporters on the ground here. Benjamin K. Hopp is an OPC minister.